Saturday saw the culmination of a lifetime’s obsession – the publication of my friend Anthony Nanson’s first novel, Deep Time. This 300 thousand plus word magnum opus Nanson has been plotting and planning consciously since the mid-Eighties, but as a charming childhood booklet, The Lost World, revealed read out by Anthony’s father, the author had been haunted by dinosaurs and the depths of time for a long time (in human terms). Many friends and family gathered at the ‘British School’, behind the popular Star Anise Café at the bottom of town, to celebrate Anthony’s 50th birthday on – and what a way to celebrate: with the launch of the handsome trade paperback edition of Deep Time by innovative Stroud-based publisher, Hawthorn Press. The dress code was ‘tropical’ and some guests had made a real effort with the costumes. We were invited from 7pm although things didn’t really kick off officially until nearly 9pm – Anthony wanted people to have plenty of time to mingle and browse the book, or rather books, as it was a double book launch – the other title, Ecozoa, published by Permanent Publications, is the new collection by radical Frome-based eco-poet, Helen Moore (another dear friend from my Bath days). Anthony, in his typically gracious way, shared the limelight with Helen – their work was thematically simpatico, and she also celebrated her birthday – as well as with other bardic friends. David Metcalfe, long-time host of the Bath Storytelling Circle MC ed the evening with his usual gravitas, starting with the crowd-pleasing Big Yellow Taxi (setting the ecobardic tone of the evening). 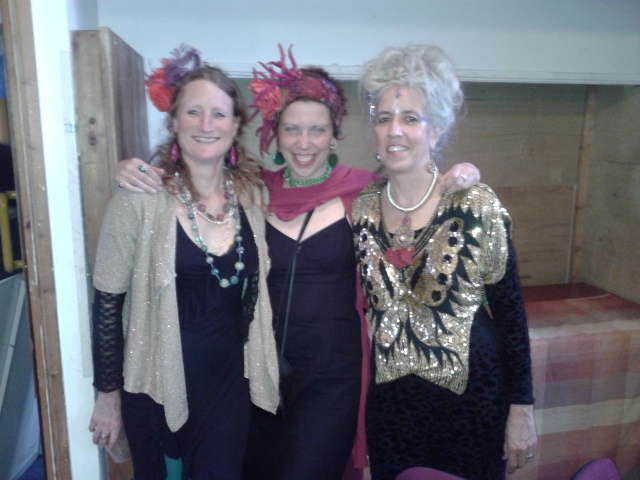 Local poet singer Jehanne Mehta – another birthday girl (on the actual day itself – Helen and Anthony’s straddle either side of it) recited a couple of stirring poems about Albion (another Blakean nod) and Wales. Poet and psychotherapist Jay Ramsay introduced Helen most eloquently and passionately. Helen performed 4 poems from the collection, one from each ‘zoa’ (the collection is structured on the 4 Zoas of Blake) with her trademark sincerity and clarity. Then fellow Bath Spa lecturer Mimi Thebo introduced Anthony, singing his praises, before Anthony introduced the book and the long journey of its evolution. Jay was invited back up to recite his epigraphic poem, before Anthony regaled us with an extract recited, impressively, from memory. Holding the book like some peripatetic preacher wielding his bible for authority (as John Wesley probably did, preaching from a butcher’s block in the Shambles, when he used to pass through Stroud), Anthony conjured up his vision of deep time with conviction and storytelling brio. He held the audience spell-bound. Some earlier drumming by Jay and local artist Herewood Gabriel evoke some kind of tribal aesthetic, and Anthony’s word-sparks now conjured up the story fire of the rainforest, the textual simulacrum of such now brought to life with his living breath. Afterwards, glasses were charged for some heartfelt toasts – to his publishers and to his parents, most poignantly his mother, whose ill health prevented her from attending. 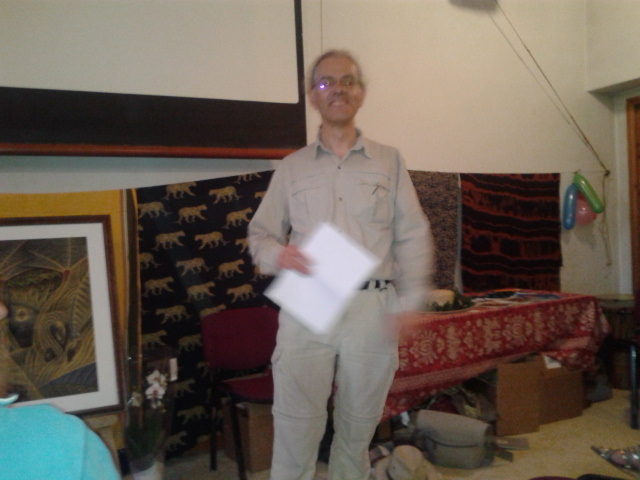 Anthony’s father took to the stage to share the embryo text from Anthony’s childhood palaeome. Finally, David finished off with his stirring version of ‘She Moves Through the Fair’. And then the revels continued for a little while longer – dinosaur cupcakes were to be imbibed (raising money for a children’s’ cancer charity) and hearty Adnams ale from Southwold, courtesy of Kirsty’s generous stepfather, Dave. There was much clearing up but many hands made light work. The babies’ respective heads had been wetted, and guests departed heart-warmed by this double-birth spectacle, but more from the quality of love that poured towards the man at the heart of it all, enjoying the harvest of half a century. This entry was posted in Books, Creative Writing, Extraordinary People, Green and tagged Anthony Nanson, Avalon, British School, David Metcalfe, Dinosaur, Ecopoetics, Ecozoa, fiction, Hawthorn Press, Helen Moore, Jehanne Mehta, Novel, Poetry, Stroud on May 11, 2015 by Kevan Manwaring.